Do you think I talk about Lush too much? I can't help it! I'm a Lush junkie! I just love everything they have to offer, and everytime they come out with a new product, it's packaging or scent list always gets me. This one is no different. 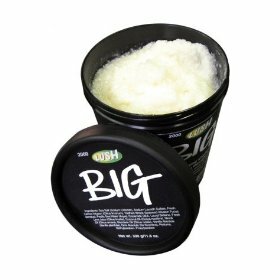 The Volume & Shine box has a 3.4 ounce tub of Marilyn deep conditioner, which is about an $8.50 value, a 1.6 ounce tub of Big shampoo, a $3.20ish value, a 3.3 ounce bottle of Veganese conditioner, a $5.25 value, and a full size Total Shine solid shampoo bar, which retails for $10. So that's about a $27 value. It all comes in a cardboard box, but the comical "Head Case" logo is what caught my attention. Another adorable package courtesy of LUSH. Another reason why I consider them perfect for gift giving. The Marilyn hair moisturizer is a deep conditioning product for your hair that also lightens your already blonde locks. This is the product I was most excited about, because I love deep conditioning my hair, and the fact that it helps with lightening your hair was a major plus. The formula itself smells a bit like lemon, and was thinner then expected. It made my hair crazy soft though, which is something rare. (My hair never feels soft!) Plus I had just gotten out of the pool when I tested this, so my hair was packed full of chlorine, which makes my hair extra tough to work with. I was the least excited about the Big Shampoo, however this proved to be the best thing in the box. The smell I wasn't crazy about it, a bit like laundry but it left my hair with volume and extreme fullness. Although my hair is already thick, I think someone having thin or oily hair would LOVE this. It gave my hair more life and it didn't look so dead. I wouldn't recommend using this everyday because it strips all the product residue out of your hair which could leave it a little dry. But once a week for me, and you have magic. 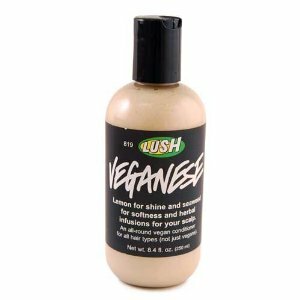 Veganese is a light lemon fragrance, meant to condition your hair after use with the BIG Shampoo. It leaves a nice touch when used with the LUSH shampoo, and it left my hair with a good amount of shine. The smell was once again so so for me, and it didn't really help with my frizz. Personally I wouldn't buy this on it's own, but as a gift package it's a nice added plus. And the LUSH shampoo bar. Oh how I've wanted to try, but never did. For some reason the idea of a shampoo bar freaks me out a bit. Something you rub on your hair that's solid ? And it looks like a laundry detergent tablet. It's just so different then what I'm used to. I was already expecting the worst. But to my surprise, I really liked it! It left my hair feeling soft and clean, extremely nice smelling. My major issue with the shampoo bar was after each use, how was I going to store it? No worries, I just put it in a little Ziploc bag after each use. I would like it if Lush figured out a better way to store such an effective little product. I'm sure they will come up with something clever. 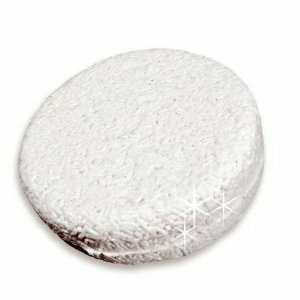 So as long as you look past your fear of using a shampoo bar, and think of it as normal shampoo you will love the results. Lush's Head Case is available now at LUSH.com for $24.95 I think this set would make a fabulous gift, and I'm recommending it for LUSH lovers everywhere. I know I was highly impressed.